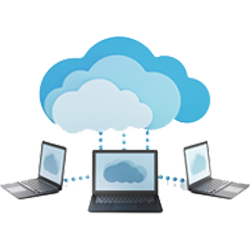 Your site is served from Cloud Web Servers while your site files live on separate file servers. The separation between the web server and file storage allows your website to be served from multiple Cloud Servers simultaneously without duplicating your content on each of those servers. It also allows your site to be added to new Cloud Servers (or removed from them) instantly. How multiple Cloud Servers are utilized? The load balancers constantly adjust traffic to balance it between all of the Cloud Servers available for your site. If a Cloud Server is ever down for any reason, the load balancer immediately routes all traffic to healthy Cloud Servers. This prevents most cases of web server downtime. You get the benefits of multiple Cloud Servers for every site you host with us at no extra charge. If you run a site that would benefit from more than two Cloud Servers, they're available to add instantly. Your site can be instantly replicated on another server at any time. So even if you only run a single Cloud Server, in the event that anything goes wrong with that server, your site spin up on a new server and traffic is routed to the healthy server. All of that happens quickly and automatically. Our modern hosting platform doesn't tie your site to a single server the way VPS, dedicated servers or traditional shared servers do. There are many other advantages as well. The Mazenet network is made up of virtual web servers whose traffic is managed by load balancers. If a web server becomes too busy or goes down for any reason, traffic is instantly routed to another server, eliminating latency. Additionally, every Mazenet site can use two (or more) load balanced Cloud Web Servers, so your site can be served from multiple separate servers at the same time, splitting the load and increasing your site's responsiveness.